If South Africa isn’t on your radar yet, it should be. This country is a mind-blowing place that doesn’t have the hype or Instagram popularity of countries such as Iceland and New Zealand…yet. If there is one country in the world that is a crowd-pleaser for the young or old, active or sedentary, budget or luxury traveler, it is here. There is something for everyone here. And not to mention, there isn’t a better time to travel there as the dollar will get you very far! (click here to read more on how to plan a DIY South Africa trip). 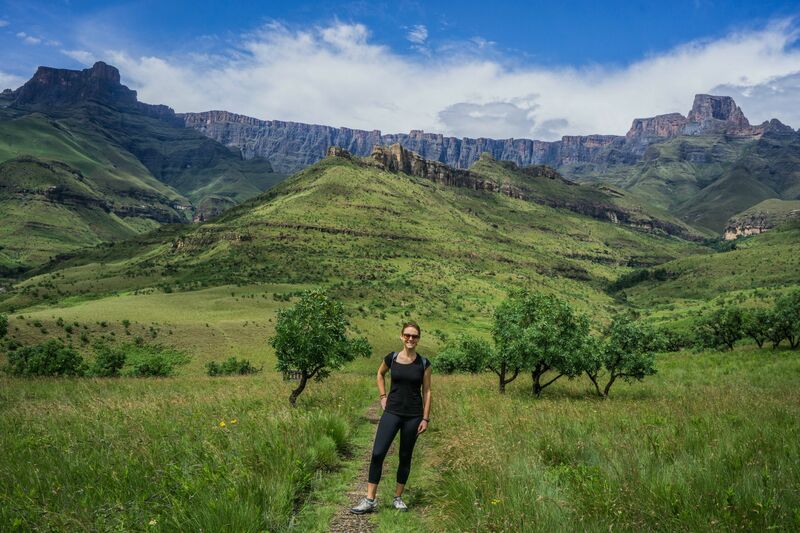 Natalie trekking the amphitheater in the Drakensberg Mountains. 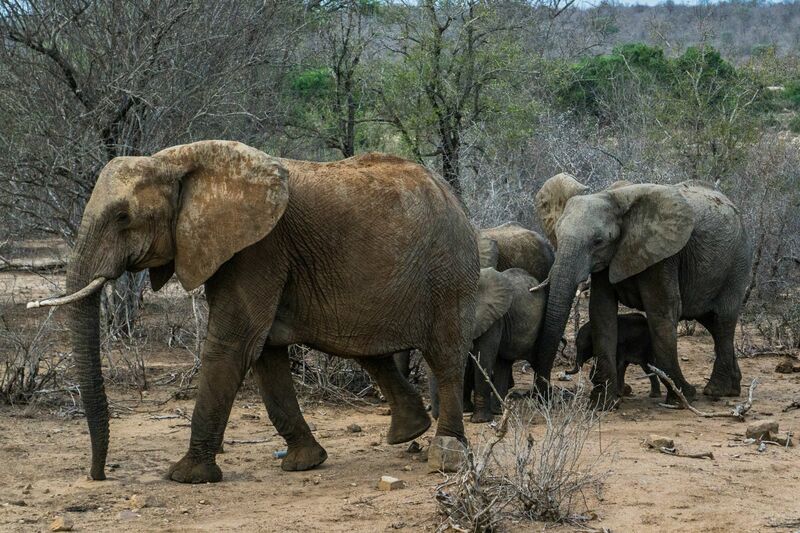 Elephant family crossing at Kruger National Park. When we arrived in Johannesburg, South Africa, we hopped into our economy rental car and started our drive to Kruger National Park for our 5 day DIY Safari (click here to read more about how to plan a DIY Safari). Driving through the lush, mountainous Long Tom Pass on the way to Kruger was an incredible way to get to the lookout point named God’s Window, with the most heavenly panorama we have seen. After the brief stop, we made our way up to the electric fence gate of Kruger National Park, where we had booked 5 nights in national park rest camps through the SAN (South Africa National) Park service. With our Wild Card (SAN Park Pass) in hand, we drove with our small rental car into the park, passing giraffes, elephants, impalas and kudu within our first few minutes. We had to stop snapping pictures to get to our air-conditioned hut before sundown at the Satara Rest Camp, part of the national park system. Satara locks its electric fence gate to keep the nocturnal predators out of the sleeping quarters each night at sundown and sunset….which made it feel like we were in a combination of the Jurassic Park and Lion King movie set in a strange way. 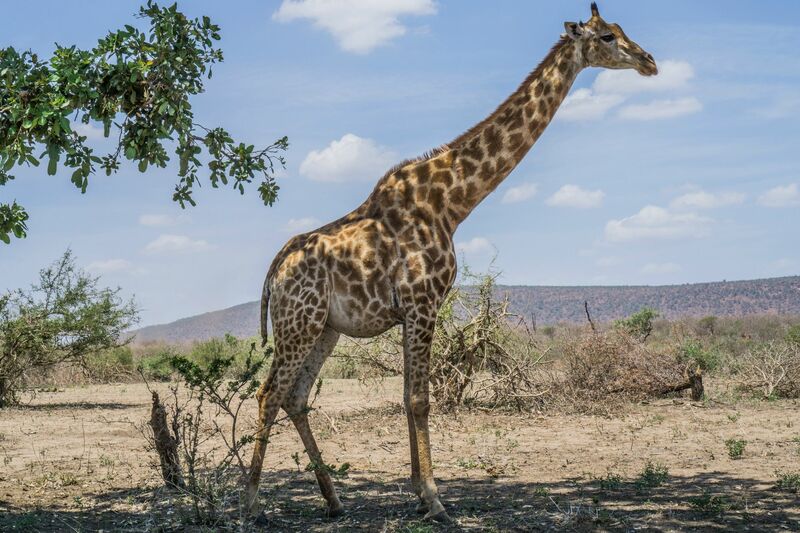 Giraffe sighting at Kruger National Park. While cooking dinner our first night in our outdoor kitchen in the circular thatched-roof hut, we were greeted by a family of warthogs, a honeybadger, monkeys and some psychedelic shiny blue birds who all wanted a piece of our dinner! We felt like we were on a dinner safari in our own kitchen! Shortly after going to bed that night we were up at 3 am clutching our mugs of instant coffee for our first Sunrise Game Drive. During our 5 days at Kruger National Park at Satara and Lower Sabie Rest Camps, we were fortunate to see the Big 5 (Rhino, Leopard, Lion, Buffalo and Elephant) in addition to hippo, giraffe, zebra, hyena, impala, kudu and baboons. However, we were most surprised at how excited our sunset drive guide was over a pack of 4 wild dogs we had spotted. Apparently, wild dogs are incredibly rare in the park and there are only 100 in the 7,500 square mile park. To put that into perspective, there are over 13,000 elephants that roam the park and only 100 wild dogs. We were very happy with ourselves after seeing the Big 5 and wild dogs in our 5 days at the park. We were ready to face the 10 hour drive ahead of us to the Drakensberg Mountain Range. 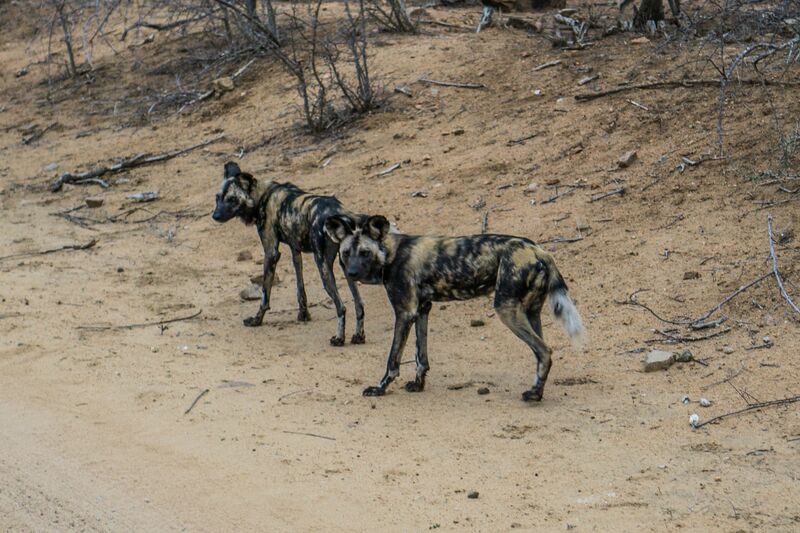 Wild Dogs were an extremely rare sight at Kruger National Park. 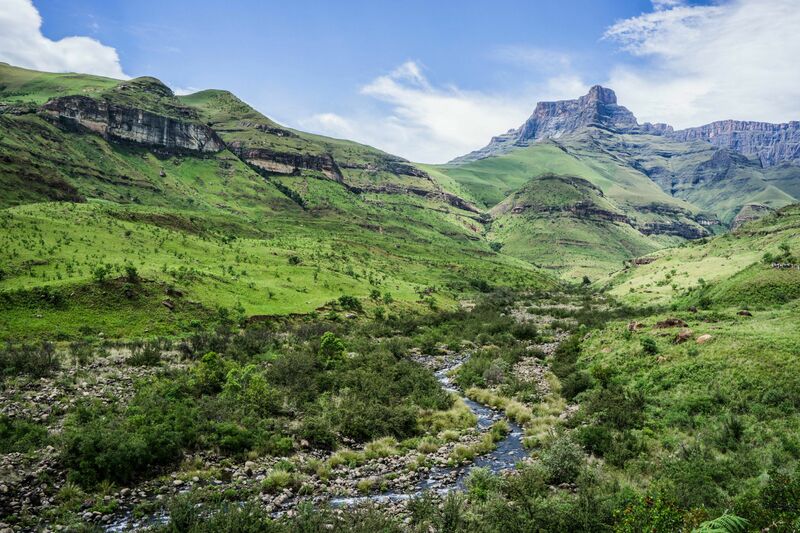 The Drakensberg Mountains are ridiculously picturesque and unique looking- if you can imagine crossing a rainforest with the Grand Canyon, that would be the next closest thing to it! The only reason we could come up with as to why this area hasn’t exploded with tourists is it’s location- it’s very difficult to get to as it is far from the major cities and airports. After driving up the narrow, giant-pothole-laden road into Zulu Natal National Park, we checked into our SAN hut at Thendele Lodge, while spotting wild zebras and baboons along the way. 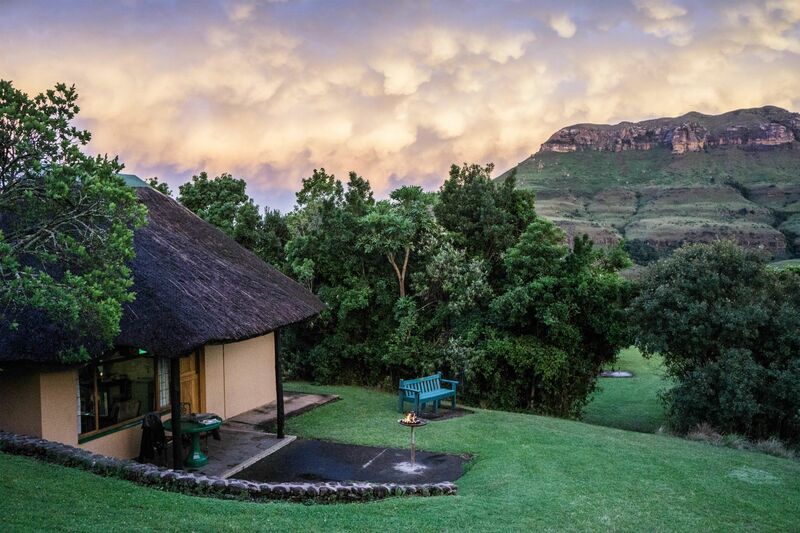 Our self-catering hut within Thendele Lodge was by far the nicest national park accommodation we have ever stayed in. We had prepared to “rough-it” without wifi while we imagined ourselves fighting the baboons for our dinner on the outdoor grill, however, we were pleasantly surprised with how nicely accomodating our hut/lodge was! We had quite possibly the best view on our trip of the “Ampitheater” in the Drakensberg Mountains right from our patio! 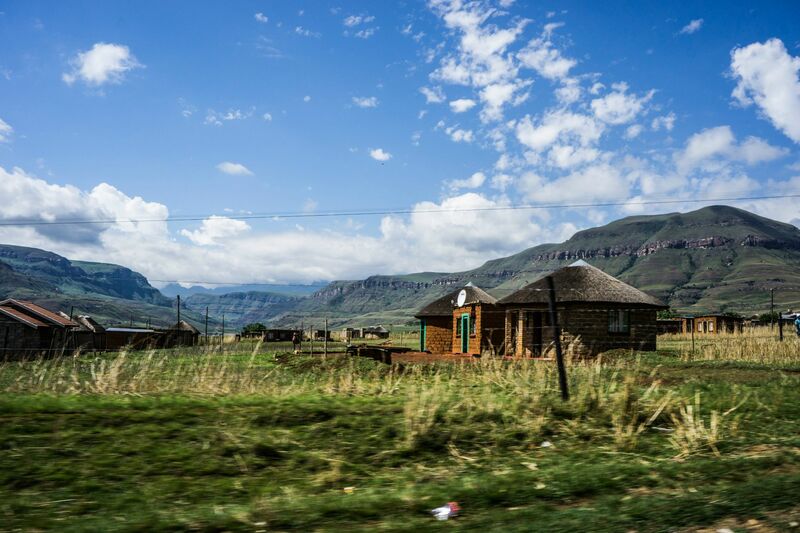 The Drakensberg area of South Africa was the most rural, remote area we have been to in South Africa and quite possibly on our trip around the world. It was incredibly beautiful but at the same time unbelievably impoverished. Many of the inhabitants did not have access to drinking water or electricity and there was a great deal of hitch-hiking due to lack of local public transit in the area. It was eye-opening to see the large amount of manual labor for agriculture there, as we were used to seeing large-scale farming equipment which is common in the states. Numerous shanty-towns were present in the more rural farming areas and on the outskirts of the cities. We spent many, many hours driving across rural and remote areas of South Africa. Port Elizabeth, your prototypical South African small city, was our next stop to start the Garden Route. This small city is located on the Indian Ocean between Durban and Cape Town. It has a great mix of everything! PE is a port city with a university, small downtown, beautiful marina and beach area while still maintaining a bit of the grittier, industrial city feel to it. It is less polished than the other destination cities on the Garden Route, but has a bit more appeal to it as it feels like a real living and breathing city with a pulse. It doesn’t cater only to the wealthy, retired group that the rest of the Garden Route seems to attract, and we appreciated that aspect of it although it wasn’t as picturesque. We did grab some delicious lunch at the original Vovo Telo Café before following the Garden Route west. Driving along the Indian Ocean, we stopped in gorgeous Plettenberg Bay to admire the view of the waves crashing into the shore from the peninsula. 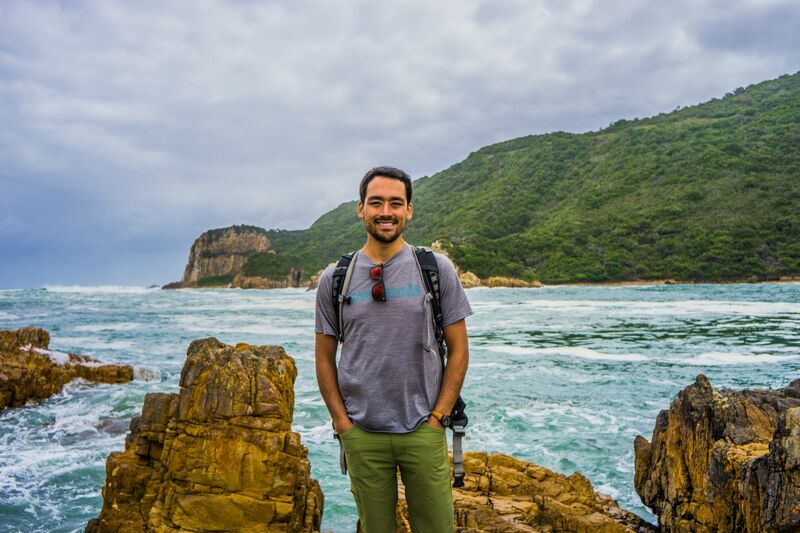 We stopped for lunch in Knysna at East Head Café, the most spectacular lunch spot with great red (rooibos) cappuccinos, brunch and delicious fresh catches from the sea. The waves literally crash up to the car park and you drive away delightfully full with a thin film of sea salt over your car windows. Knysa was a beautiful stop along the Garden Route. Continuing on, we stopped in the town of George for an impromptu 18 holes of golf which reminded us how rusty our swings were. We ate at the Bayleaf Café, a cute, shabby chic breakfast spot with delicious coffee. South Africa does not disappoint on with their restaurant scene. You can have an incredible meal anywhere. For a great steak, The Grumpy Griller has a tiny menu and probably the best steak of our trip! Just grab a bottle of South African Pinotage wine at the local Pick-n-Pay supermarket, bring it in BYOB, pick out your cut of steak (which is the only item on the menu), and the chef will grill it up for you. At the end of the meal, your stomach and wallet will both be happy. A bottle of Pinotage + T-Bone steak at a restaurant for $15USD??? This would NEVER happen in the states! Five nights in Stellenbosch, the wineland region of South Africa, was one of the best decisions we have made! This area is incredibly gorgeous, set near the mountains and the ocean. This wine region is the most beautiful wine region we have seen…New Zealand, Italy and Napa don’t even compare! You have to see it to believe it! Stellenbosch’s buildings have Cape Dutch architecture- a traditional Africaner style and it’s Stellenbosch University’s main campus is in the city center giving it a nice mix of young university students with older wine connoisseurs. Stellenbosch’s vineyards are gorgeous, the restaurants are to die for, and the tastings will put you back about $2-3 USD with the bottles not costing very much more. Josh and I enjoyed tasting the Pinotage and Chenin Blanc varietals. During our stay, we happened to walk into a Soiree, an outdoor food and wine tasting on the street. This only set us each back 70 Rand (less than $5) and we were able to stroll the beautiful streets while tasting the local wines poured from each winery’s booth. 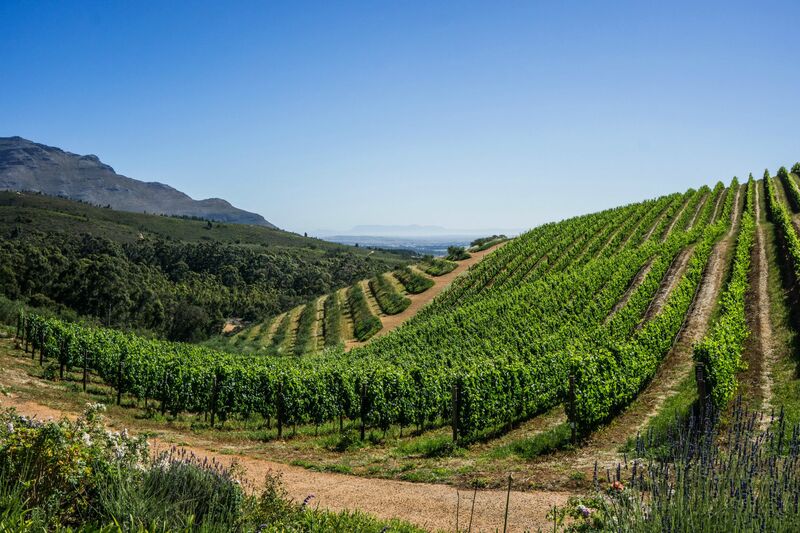 The vineyards of Stellenbosch were stunning, especially given the landscape. 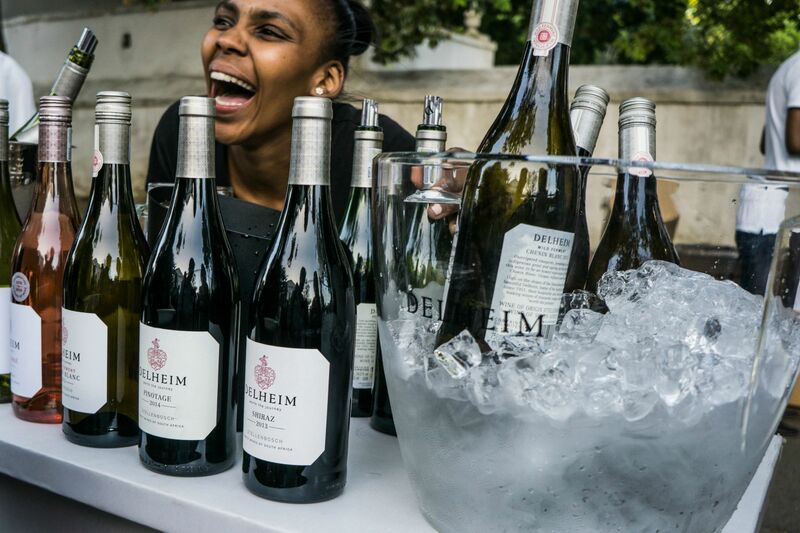 While in Stellenbosch we stumbled upon a soiree and sampled delicious food and wine. To end our 3 week road trip, we saved the best for last. Our final 4 days were spent in Cape Town, quite possibly the most incredible city in the world! Cape Town was our favorite city on our world trip for so many reasons. Table Mountain, one of the new 7 Natural Wonders of the World, is a backdrop to this coastal city. 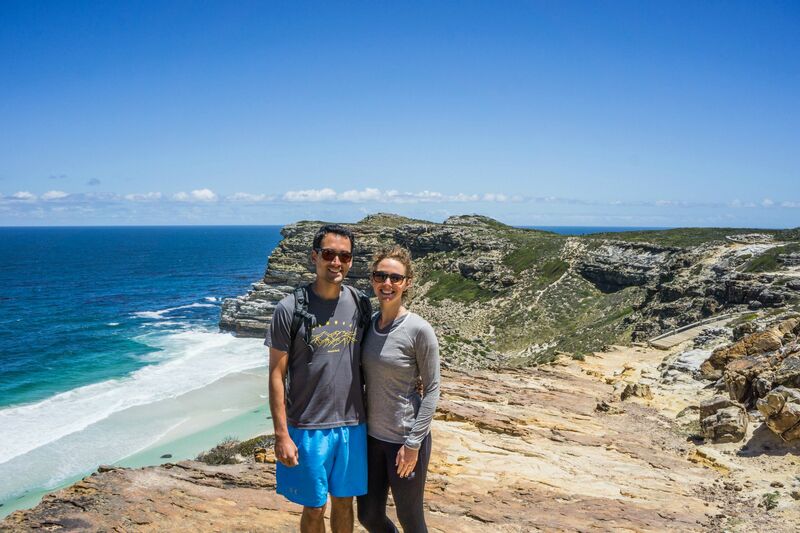 We hiked Lion’s Head for a 360 degree view of the city, rode the cable car up to the top of Table Mountain, saw the Indian and Atlantic Oceans collide at the Cape of Good Hope on Cape Peninsula, and took the ferry to see Robben Island, where Nelson Mandela was locked away for 18 years. Not to mention all of the delicious food we ate at Camp’s Bay and the V&A Waterfront. We got a taste of the good life in Cape Town thanks to our South African friends Merise, Lance, Liesl and Baby Ben! 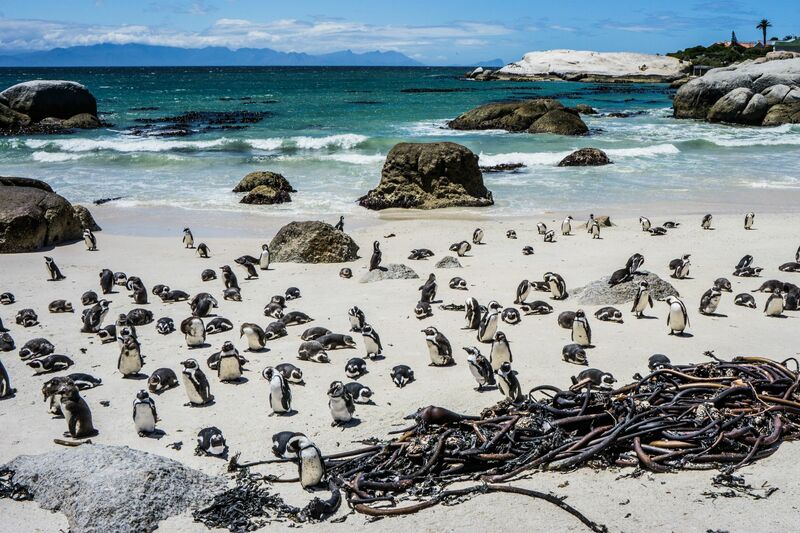 Penguins at Boulders Beach near Cape Town.